The APC is honoured to welcome Mrs. Hélène Langevin-Joliot for a science coffee workshop on Thursday, October 11, 2018 between 12:30 and 2:00 p.m., in the Luc Valentin room. Hélène Langevin-Joliot is a researcher in fundamental nuclear physics, renowned for her work on medium-energy nuclear reactions and nuclei states revealing individual movements of high-energy excitation nucleons. 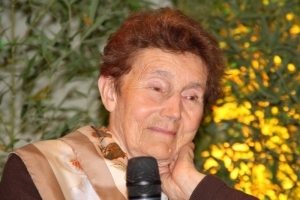 She is the daughter of Frédéric and Irène Joliot-Curie (Nobel Prize in Chemistry in 1935) and the granddaughter of Pierre Curie (Nobel Prize in Physics in 1903) and Marie Curie (Nobel Prize in Physics in 1903 and Nobel Prize in Chemistry in 1911). Following her parents’ example, she has shown a strong militant commitment to the peaceful use of nuclear energy and the place of women in science. It will also address the issues associated with the place of women in the choice of their studies, and in the evolution of the various careers envisaged. A question and answer session on the importance of science education, its social impact and other future perspectives will be held over a gourmet coffee.